Gary Michie portrays Dr. Gatling as he answers questions about the Gatling gun during a Civil War reenactment event in Ferndale, WA. As Major Michie, Gary commands the 1st Michigan Light Artillery, Battery E unit as part of the Washington Civil War Association's Union Battalion of the Army of the Columbia. 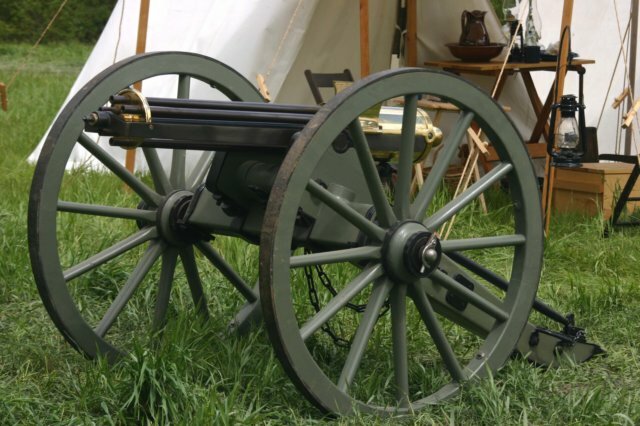 Gary is a retired machinist and an inventor, and has directed his skills toward producing historically correct reproductions of Dr. Gatling's early rapid-repeating fire arms. Much research effort has been expended to ensure that the resulting Gatling gun conforms as closely as possible to Richard Gatling's original productions. 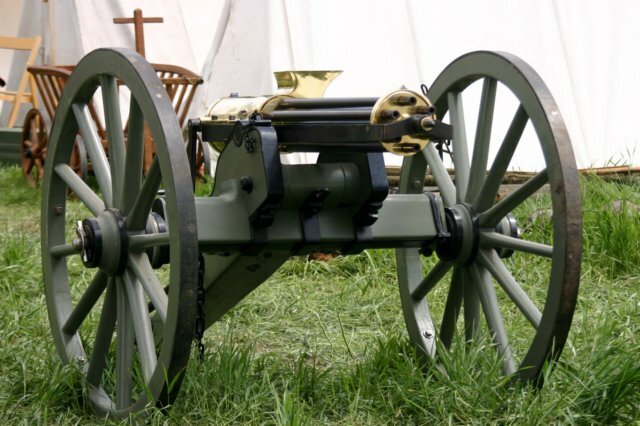 As a result, Michie Armory is now making working reproduction 1862 Type 1 Gatling Guns available for sale to reenactors and collectors. The reproduction Gatling gun is built to the original 1862 drawings and specifications. Advances in machine tooling and metallurgy over the past 150 years allow the reproduction device to be built with better materials and tighter tolerances. The resulting product is more durable and has better fit and finish than was possible in 1862, as well as improved safety. The gun is mounted on a hardwood carriage with steel tires, built to #1 Prairie Carriage specifications. The result is a work of beauty.